3. Two taps can fill a tank in 4 hours and 5 hours respectively. It both the taps are opened alternatively for 1 hour, starting with the first. How much time will it take to all the tank. 5. 5 women and 2 men working together can do four times as much work per hour as a woman and a man together. Compare the work of a woman with that of a man. 6. 12 boys or 15 girls can do a certain work in 14 days. Find the number of days that 7 boys and 5 girls will take to complete the same work. 7. Two pipes A and B can fill a cistern in 20 and 24 min respectively. Both pipe being opened; find when the first pipe must be turned off, so that the cistern may be filled in 12 min. 8. Pipes A and B fill a tank in 30 minutes and 15 minutes. Pipe C drains 12 litres of water in a minute. If all of them are kept open when the tank is full, the tank empties in 30 minutes. 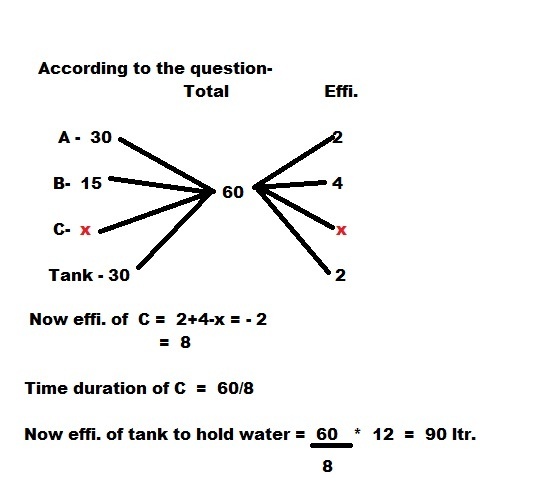 How much water can the tank hold? 9. 10 boys can finish a certain work in 10 days, whereas it takes 12 girls to finish it in 10 days. If 15 boys and 6 girls undertake to complete the work, how many days will they take to complete it? The Cistern is to be filled in 12 min. Second pipe can fill only 12/24=1/2 of the cistern in total time. This means the other half of the tank will be filled in 10 min.